Stuffing your new foam into your covers is another one of the many services we provide. However, in some situations, like when your cushion covers are sewn into your sofa, we aren’t going to be able to help you with this final step of the project. Below are a few important tips to consider when stuffing your new foam cushions. Before stuffing your new cushions, be sure your covers are ready for them. If you need to make any repairs, or want to wash your covers, now is the perfect opportunity to do so. Just be sure to avoid any heat during the washing process to prevent your covers from shrinking. Cushion covers that have shrunk can cause some pretty glaring visual problems with the final product. The “hotdog” method involves folding the foam in half like (you guessed it) a hotdog. It can then be tied in position, held by your hands or held between your knees. If you choose to bind the foam, be sure to use material that is wide enough to resist cutting into the foam while it holds it in place. Once your cushion is folded, insert the foam as far as you can into your cover before letting go (or releasing the bind) and working the rest of the cover on by pulling the fabric and twisting the corners down into place. 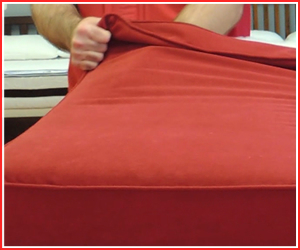 The “game of inches” method involves leaving the cushion in a flat state and pulling the cover over top. This creates a large amount of friction between the foam and the cover, so success is often achieved by pulling the fabric one inch on one side of the cover, then one inch on the other side of the cover, and repeating until the foam is fully inside. The most common problem customers encounter when stuffing their cushions is a popped zipper. Stuffing new foam into your cushion can create a lot of pressure, and the zipper will be the weakest part of your cushion. Be sure to position the foam cushion in a way that minimizes pressure on the zipper. Never leave your cushion halfway stuffed into the cover. Once your cushion is inside your cover, focus on aligning the seams and straightening the corners. Once these are filled out correctly, you will have a sharp and professional new cushion. In the most extreme cases where the zipper length is very small, or the foam is very firm, you may need to use a vacuum to help stuff your cushions. Do this by wrapping the cushion in plastic, inserting the hose of the vacuum into the bag, and turning it on. Be sure to position the end of the vacuum against the foam cushion to prevent the plastic from shrinking around the end of the hose. The foam cushion will shrink, allowing you to insert it into the cover. Once the cushion is small enough, insert it inside your cover, turn the vacuum off, remove the hose, and the cushion will grow inside the cover. Removing all excess plastic from inside the cushion is the last (and most difficult) step in this process, so be sure to plan ahead by placing the opening of the bag inside the cover for easier removal.